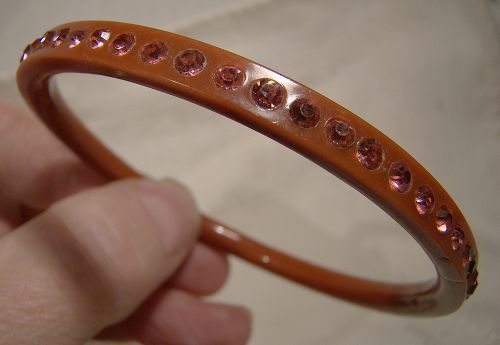 An unusual Art Deco period vintage 2-5/8" across the toffee-brown bakelite bangle bracelet c1920-30, with flashy pink rhinestones. The original colour of this bangle would have almost surely been a mauve or light purple colour, but vintage bakelite does usually alter in colour over the years, so the colour is now a warm toffee amber-brown shade. This bangle measures 3/16" wide and 3/16" thick, and the interior wall to wall measurement is 2-9/16" across. It is in excellent original condition with no chips, cracks, losses, damage or repairs other the darkening of three pink stones. Please note that the celluloid is a deeper pink/brown than in our light pictures, not red. All items are thoroughly and conservatively graded and all condition issues are noted; all items are secondhand and may have slight signs of gentle use. Small packet air shipping to the U.S. starts at $9.50 (other spots may vary). Items paid with a credit card will be shipped to confirmed addresses only. We do ship internationally. All of our prices are in $US. PLEASE NOTE: We DO NOT accept PayPal, only VISA and MASTERCARD. 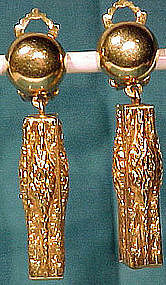 A modern design German pair of gold plated clip-on drop earrings c1960-70. These 2-1/4" x 1/2" earrings are stamped GERMANY, and they are in excellent original condition with no dents, bends, corrosion, losses, damage or repairs. All items are thoroughly and conservatively graded and all condition issues are noted; all items are secondhand and may have slight signs of gentle use. Surface shipping to the continental U.S. starts at $6 (other spots may vary) - insured is higher, and mandatory on items over $85 if paid with a credit card. Items paid with a credit card will be shipped to confirmed addresses only. We do ship internationally. All of our prices are in $US. NOTE: we do not accept PayPal. A 10k yellow gold amethyst & pearl brooch circa 1890. 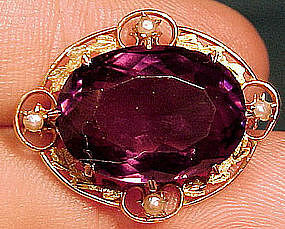 This nice 1-1/8 x 7/8" faceted, claw-set amethyst and pearls pin features a fine foliate border, it is in 10k yellow gold, it is stamped 10K with a maker's mark, and it weighs 5.5 grams. The stone is untested, it has a safety catch, and this lovely pin is in excellent original condition with no chips, cracks, dents, bends, corrosion, losses, damage or repairs. All items are thoroughly and conservatively graded and all condition issues are noted; all items are vintage or antique and may have slight signs of gentle use. Expedited tracked and insured parcel shipping to the U.S. starts at $25 (other spots may vary, air is higher). Items paid with a credit card will be shipped to confirmed addresses only. We do ship internationally. All of our prices are in $US. PLEASE NOTE: We DO NOT accept PayPal. A fish setting for six in the silverplated Penbury pattern, issued by Mappin & Webb from 1918-19. 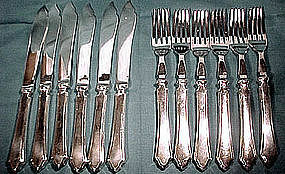 This set consists of six each of the 8-5/8" fish knives and the 7-1/2" fish forks. This set is in excellent original condition with no dents, bends, corrosion, losses, damage or repairs. All items are thoroughly and conservatively graded and all condition issues are noted; all items are secondhand and may have slight signs of gentle use. Surface shipping to the continental U.S. starts at $12 (other spots may vary) - insured is higher, and mandatory on items over $85 if paid with a credit card. Items paid with a credit card will be shipped to confirmed addresses only. We do ship internationally. All of our prices are in $US. NOTE: we do not accept PayPal. 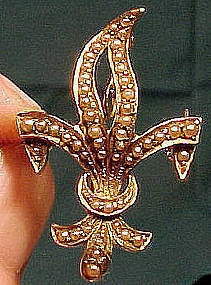 A 14k fleur-de-lys seed pearl chatelaine pendant pin. This well-made and attractive Victorian 1-1/4" x 7/8" fleur-de-lys pin is in 14k yellow gold with seed pearls. This brooch has a chatelaine hook, a folding swivel loop for wear as a pendant and a safety catch. It weighs 4.2 grams, it is stamped 14K with an unidentified maker's mark, and it is in excellent original condition with no chips, cracks, dents, corrosion, losses, damage or repairs other than the chatelaine hook is slightly pushed in to the back of the pin (easily fixed). All items are thoroughly and conservatively graded and all condition issues are noted; all items are secondhand and may have slight signs of gentle use. Expedited tracked shipping to the U.S. starts at $22 (other spots may vary) - insurance and tracking included in shipping quotes. Items paid with a credit card will be shipped to confirmed addresses only. We do ship internationally. All of our prices are in $US. PLEASE NOTE: We DO NOT accept Paypal. 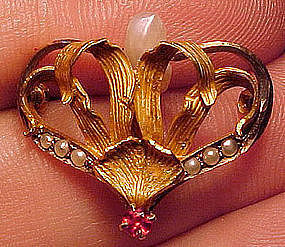 A splendid, vintage Art Nouveau chatelaine pin in 12k gold (unmarked except for "GOLD" but tested) with seed pearls, a baroque pearl drop and a claw-set garnet (untested). This brooch has everything Art Nouveau is known for - sinuous and naturalistic design, pearls and finish; it has a c-clasp and it measures 1 x 7/8". It weighs 3.0 grams and it is in excellent original condition with no chips, cracks, dents, bends, corrosion, losses, damage or repairs; the hook for suspending a watch or accessory is tucked into the back and can be opened up if desired. All items are thoroughly and conservatively graded and all condition issues are noted; all items are secondhand and may have slight signs of gentle use. Surface shipping to the continental U.S. starts at $6 (other spots may vary) - insured is higher, and mandatory on items over $85 if paid with a credit card. Items paid with a credit card will be shipped to confirmed addresses only. We do ship internationally. All of our prices are in $US. NOTE: we do not accept PayPal. 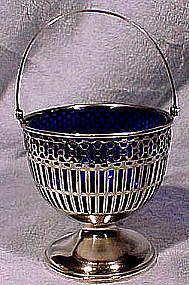 An attractive American sterling silver swing handle sugar basket c1900 with the original cobalt glass liner. This 3-3/8" diameter bowl stands 3-1/2" high (6-1/8" with the handle), it has the Webster maker's mark with STERLING and the 10400 pattern number and it has a lightly engraved Gothic lettering E.T.Y monogram on the top of the handle (not shown). It weighs 90 grams without the liner, and this elegant table accessory is in excellent original condition with no chips, cracks, bends, corrosion, losses, damage or repairs other than a tiny dent on the upper rim and a slight flattening of a small area of the foot (both very slight). All items are thoroughly and conservatively graded and all condition issues are noted; all items are secondhand and may have slight signs of gentle use. Surface shipping to the continental U.S. starts at $8 (other spots may vary) - insured is higher, and mandatory on items over $85 if paid with a credit card. Items paid with a credit card will be shipped to confirmed addresses only. We do ship internationally. All of our prices are in $US. NOTE: we do not accept PayPal. 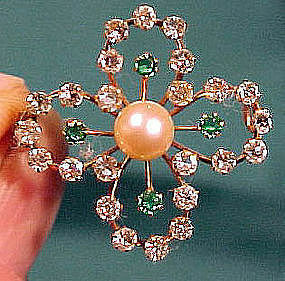 An Edwardian 9k pearl and paste stones brooch circa 1900 - 1910. 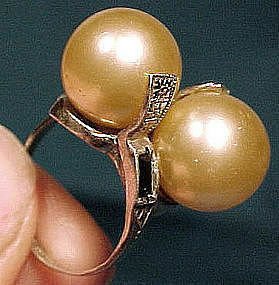 This antique 1" across yellow gold pin has a 5.7 mm genuine pearl in the center. 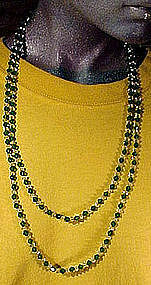 The pearl has a nice cream-color lustre, and the four surrounding stones are synthetic emeralds (or green paste) and the rest are clear paste (or possibly white sapphires - all of these open-back stones are untested). This Belle Epoque period piece was made with sufficient backing to allow it also to be worn on a hat or as part of the hair-style for the evening. It has the original c-clasp and is marked 9CT on the pin. It weighs 2.0 grams. It is in excellent vintage condition with no chips, cracks, dents, bends, corrosion, losses, damage or repairs. All condition issues are noted; all items are vintage or antique and may have signs of use and patina as would be expected. Expedited tracked parcel to the U.S. starts at $20 (other spots may vary). Items paid with a credit card will be sent to confirmed addresses only. All of our prices are in $US. PLEASE NOTE: We do not accept PayPal. An Aesthetic sterling pin with green & pink gold circa 1870s. This vintage and opulent Aesthetic Movement sterling brooch has inlaid rose and green gold. This 1-3/8" x 1-1/8" pin has a notched and ball border with a hand-engraved floral interior featuring rose gold flowers and green gold leaves. It has the original c-clasp. It is unmarked (but tested) and is guaranteed to be silver. It is in excellent condition with no breaks, corrosion, losses, damage or repairs other than some shallowly scratched letters on the back. All items are thoroughly and conservatively graded and all condition issues are noted; all items are vintage or antique and may have slight signs of gentle use. Expedited tracked and insured parcel shipping to the U.S. starts at $19 (other spots may vary, air is higher). Items paid with a credit card will be shipped to confirmed addresses only. We do ship internationally. All of our prices are in $US. PLEASE NOTE: We DO NOT accept PayPal. 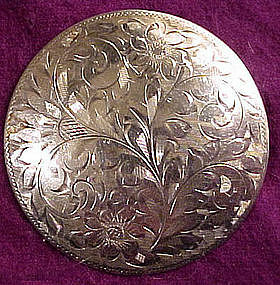 A 2" across round hand engraved brooch in sterling silver, made by W.E. Richards, founded c1900 in Attleboro, Ma. 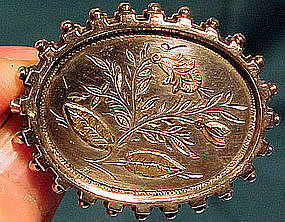 This pin has a safety catch, it is stamped STERLING with the Richards maker's mark, and it weighs 13.2 grams. This item is in excellent original condition with no dents, bends, corrosion, losses, damage or repairs. All items are thoroughly and conservatively graded and all condition issues are noted; all items are secondhand and may have slight signs of gentle use. Surface shipping to the continental U.S. starts at $6 (other spots may vary) - insured is higher, and mandatory on items over $85 if paid with a credit card. Items paid with a credit card will be shipped to confirmed addresses only. We do ship internationally. All of our prices are in $US. NOTE: we do not accept PayPal. 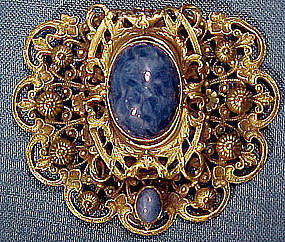 An ornate gilt filigree 2-1/8 x 1-7/8" dress clip with blue mottled glass cabochon stones c1910-20. This unsigned clip is undoubtedly Czechoslovakian, and it is in excellent original condition with no chips, cracks, dents, bends, corrosion, losses, damage or repairs. All items are thoroughly and conservatively graded and all condition issues are noted; all items are secondhand and may have slight signs of gentle use. Surface shipping to the continental U.S. starts at $6 (other spots may vary) - insured is higher, and mandatory on items over $85 if paid with a credit card. Items paid with a credit card will be shipped to confirmed addresses only. We do ship internationally. All of our prices are in $US. NOTE: we do not accept PayPal. An attractive bow-tie shaped Czechoslovakian gilt brooch with rhinestones and light green baisse-taille enamel. This 1-1/2 x 5/8" vintage c1920-30 Art Deco pin has a c-clasp, it is stamped CZECHOSLOVAKIA, and it is in excellent original condition with no chips, cracks, crazing, dents, bends, corrosion, losses, damage or repairs. All items are thoroughly and conservatively graded and all condition issues are noted; all items are secondhand and may have slight signs of gentle use. Surface shipping to the continental U.S. starts at $6 (other spots may vary) - insured is higher, and mandatory on items over $85 if paid with a credit card. Items paid with a credit card will be shipped to confirmed addresses only. We do ship internationally. All of our prices are in $US. NOTE: we do not accept PayPal. 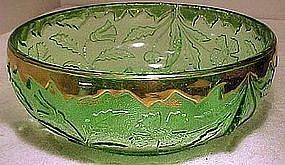 An attractive early American pattern or pressed glass 8-1/4" diameter and 3-3/8" tall fruit bowl in the Delaware pattern, issued by the U.S. Glass Company in 1899. This item is in excellent original condition with no chips, cracks, losses, damage or repairs other than some minor rubbing to the thick gilt edge which appears about 90% intact. All items are thoroughly and conservatively graded and all condition issues are noted; all items are secondhand and may have slight signs of gentle use. Surface shipping to the continental U.S. starts at $16 (other spots may vary) - insured is higher, and mandatory on items over $85 if paid with a credit card. Items paid with a credit card will be shipped to confirmed addresses only. We do ship internationally. All of our prices are in $US. NOTE: we do not accept PayPal. 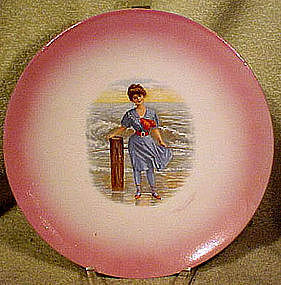 An 8-1/4" porcelain plate depicting a Victorian bathing beauty in a swimming costume at the beach c1890s. This plate is transfer printed with a shaded pink ground; it has a pseudo Sevres mark and it could be American or European. This item is in excellent original condition with no chips, cracks, crazing, losses, damage or repairs other than a couple of minor scratches to the image. All items are thoroughly and conservatively graded and all condition issues are noted; all items are secondhand and may have slight signs of gentle use. Surface shipping to the continental U.S. starts at $8 (other spots may vary) - insured is higher, and mandatory on items over $85 if paid with a credit card. Items paid with a credit card will be shipped to confirmed addresses only. We do ship internationally. All of our prices are in $US. NOTE: we do not accept PayPal. 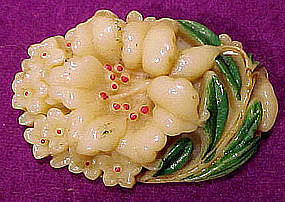 A vintage celluloid plastic 1-3/4" x 1-1/8" hand painted flower pin c1930s. This unsigned brooch features green and red painted highlights and it has a nickel plated c-clasp pin; it is in excellent original condition with no chips, cracks, dents, bends, corrosion, losses, damage or repairs. All items are thoroughly and conservatively graded and all condition issues are noted; all items are secondhand and may have slight signs of gentle use. Small packet air shipping to the U.S. starts at $9.50 (other spots may vary) - insured is higher. Items paid with a credit card will be shipped to confirmed addresses only. We do ship internationally. All of our prices are in $US. PLEASE NOTE: We DO NOT accept PayPal.